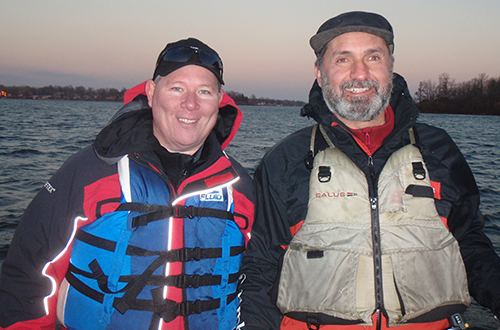 A mid-November day on the St. Lawrence fishing with Luc Girard and John Chang for monster Musky can be a cold and frustrating experience. We explored a stretch of river between Lake St. Francis and Cornwall, a section known for plenty of structure, deep channels, endless shallow flats, and rocky shoals that go for miles. The day offered up cold winds, plenty of waves and strong current. Thank goodness the sun kept temperatures just above freezing, with water temps in the low 50’s. 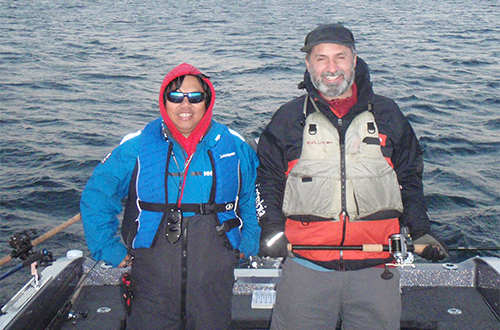 My guest aboard the Ranger 620 Fisherman was Luc Girard. Luc is a member of Musky Inc and Cornwall’s Lunker Hunt fishing club, and a dedicated steward of the river. Luc is one of those anglers who truly cares about the future of fishing. In addition to his love for the sport, he’s volunteering for numerous local water conservation initiatives. He’s fully equipped to conduct fish tagging on behalf of the St. Lawrence River Institute for Environmental Science, helped organize a shoreline clean-up with 400 volunteers that pulled over 12 tons of garbage out of the river, monitors oil slicks on the river and reports spotting to the Coast guard over a 3-month period following the sinking of two tugboats on the river, supports several area charity fishing derbies, and so much more. Luc does all this with a smile on his face and a positive attitude even though the arthritis in his hands is growing increasingly severe, and the three surgeries on his back have still not addressed the problem with his spine. His dedication to the river and love of fishing make up a large part of who Luc is, and he’s happy to share his passion with others, young and old. After our sprint home up-current into the wind and waves at a thrilling 55 mph, we were all feeling a bit cold, wind-burnt and tired. And then the sun went down and everything changed. The red sun sunk into the river bringing to an end the wind just as a huge ocean-going ship lit up like a floating city came into view. Moments later a super bright “Super” moon popped up from behind one of the 33 islands clustered along this stretch of river. Even though I only have the one tiny window in the upper left section of my left eye, I still managed to witness both the day draw to a close and the night commence. After we finished gawking at this dramatic shift in time and space, my buddy John Chang idled the Ranger over to the doc. The solar/lunar sightings and meal of Perch at a near-by restaurant with good friends, new and old, was a well-deserved end to a bone-chilling day.